Want to earn some cash as an Uber driver? As much as we might like to, we simply just can’t take the money and run (or call an Uber!). As a self-employed contractor, you’ll have certain responsibilities in reporting your income and annual profits to the Australian Taxation Office (ATO). The ATO issues penalties for failing to meet tax obligations which can range from hundreds to thousands of dollars. Complying with tax obligations can be a quick and easy process provided you follow 5 basic steps that I have detailed below which I’m going to call the Uber5. The acronym ABN stands for Australian Business Number. Each person or entity operating a business in Australia requires an ABN. You can apply for an ABN online via the Australian Business Register website; www.abr.gov.au. There is no fee for ABN applications. Can I deal with the ATO directly? Although many individuals and businesses choose to use the services of a BAS agent or accountant, you can deal directly with the ATO if you so choose. The easiest way to do this is through the Business Portal, an online application provided by the ATO where you can manage your registrations and view and send business information to government online. To be able to access the Business portal you will need to apply for an AUSkey which is a secure login that identifies you when you use the Business Portal. Like your ABN, there is no charge associated with obtaining an AUSkey. For further information on registering for an AUSkey, setting up or managing your AUSkey, visit the ABR website- Australian Business Register website, www.abr.gov.au. As an Uber driver you provide ride-sourcing services. Recently the Federal Court of Australia has handed down its decision that ride-sourcing is taxi travel. This is because you make a car available for public hire and use it to transport passengers for a fare. Under Goods & Services Tax (GST) law, if you carry on business and provide taxi travel services, you are required to be registered for GST. Other types of businesses are only required to register for GST if they earn in excess of $75,000 per year however this is NOT the case for taxi or ride-sourcing services. What is GST and is it the same as BAS? The Australian Taxation Office defines GST (Goods & Services Tax) as a tax of 10% on most goods and services sold or consumed in Australia. As a contracted Uber driver, you are seen as running a business and you need to know about GST. Once your business is registered for GST you need to account for GST in your income from Uber. You can also claim credits for the GST included in the price of purchases for your business. When you calculate the GST you need to pay to the ATO you take the portion of GST you receive in your income from Uber then deduct the amount of GST you have paid out in your expenses and purchases. The balance will equal the GST you need to pay to the ATO. GST is reported to the ATO on a BAS (Business Activity Statement). Either yourself or a registered BAS agent or accountant can lodge a BAS on behalf of your business. BAS are most commonly lodged each quarter, however you are able to lodge on a monthly basis which may assist your cash flow. BAS can be lodged online via the Business or Tax Agent Portal however you can ask for a paper copy to be sent to you. For additional information on lodging your BAS, speak to a registered BAS agent, an accountant or the Australian Taxation Office. You must have an ABN to register for GST. If you have access to the Business Portal via an AUSkey as outlined above, you can register for GST online, otherwise you can seek the assistance of a registered BAS agent or accountant. If you are not an Australian resident there may be special rules that will also apply. Now that you have registered your business and set up for GST, you will need to start tracking your income and expenses. Expenses and receipt management is very important. You need to know exactly what you can and can’t claim and what records you need to keep. The world of what includes or doesn’t include GST can be a little confusing. Most of the expenses you will incur while running your business will have GST included in the price. Common items that don’t have GST include bottled water and bank interest payments. An online search is available on the ASIC Moneysmart website ATO website here. Otherwise contact your BAS agent or accountant for further information. The set rate for GST is ten percent (10%). To calculate the GST portion of your income or expenses, take your gross figure (total amount you have paid or received) and divide that figure by eleven (11). The sum will equal the GST component. For example, say my annual car registration cost is $670. To find out how much GST is included in that price, I divide $670 by eleven (11), which equals $60.90. This means that from my total expense of $670 for car registration, $60.90 was the GST component. Although the rate for GST is strictly ten percent (10%) sometimes you may receive a bill where some items are subject to GST while others aren’t. It is good practice to check your bills or receipts in detail. Take car registration as an example. Say the total cost is $820. However, you can’t use the above rule to calculate the GST component because that would result in me overstating the amount of GST I have paid. The reason for this is because car registration expense is broken down into a mixture of taxable and non-taxable items. So check your receipts carefully. There are several articles out there that give tips on how to separate personal and business expenses, such as setting up a separate bank account for the business or using separate shoeboxes to store your receipts. An easy way to stay on track is downloading an app like QuickBooks Self Employed. It connects with your bank and imports your transactions so you can categorise expenses and income as personal or business. However, when you’re a sole trader it is sometimes not so easy as one bill or expense can be for both personal and business purposes. 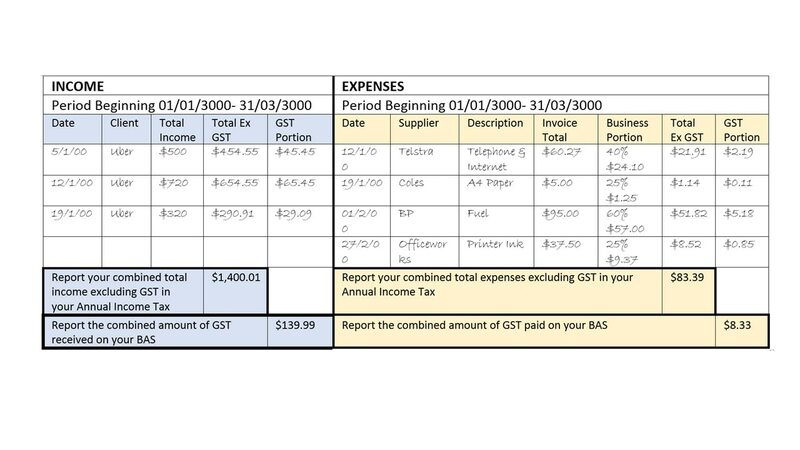 To accurately report GST you need to only claim on business expenses. Calculating how much of an expense is business related will depend mostly on the expense. The easiest way is by keeping a diary or calculating business expenses from an itemised bill, for example if every time you purchase a ream of paper you use about ¼ of it printing out your Uber statements then simply claim ¼ of your paper expenses and ink as business purchases. Calculating your business telephone and data usage is just as easy, simply take your last three-monthly bills (provided you have been driving for Uber for the past three months) as having twelve (12) weeks of records is a good comparison. Highlight each of the Uber related calls on your phone bill, if you made three hundred (300) calls in total over the past three months and ninety (90) of those calls related to driving for Uber then thirty percent (30%) of your phone bill is business related. You claim that 30% expense and any associated GST when reporting your taxes. If you are using accounting software such as QuickBooks Self-Employed, you can set rules to automatically split your regular expenses by the appropriate percentage. To be able to claim a deduction on any vehicle expenses, you or your partner must own or be named as the lease or hire purchaser of the vehicle. The ATO has provided a calculator to assist sole traders with claiming home office expenses, so visit their website for further information or contact a registered BAS agent or accountant. Tax law states that records can be kept in hard copy or electronically and all records need to be kept for five years following the lodgement of your tax return. A simple way to record your income and expenses in hardcopy format is to use an exercise or ledger book. Set up your book so that there are 5 columns on one side of the book and 7 columns on the other side as per example below. Once you fill out your income and expense details in the ledger, it can be used for reporting GST on your BAS as well as reporting your income tax at the end of each financial year. Flip the page in your book and use a separate sheet for every quarter or monthly if that’s how you report your GST. Of course, with technology at the touch of our finger-tips you might choose to adopt a quicker, more effective way to keep record of your income and expenses. Save time using online programs or apps. The most affordable, user friendly online program/app product on the market today is QuickBooks Self-Employed. For a minimal monthly subscription fee (yes you can claim the entire fee as a business expense) you can record your income and expenses on your computer, tablet or smartphone. You can also capture images of receipts so no more hoarding shoeboxes! For further information, visit QuickBooks Self Employed. As an Uber Contractor operating as a sole trader or in a partnership, you can select between two different methods for claiming car expenses depending on what suits you best, but again, the easiest way to track your mileage is by using the QuickBooks Self Employed app, with automatic GPS mileage tracking. It records every trip automatically, so you just need to categorise each trip as personal or business. Remember- you can only claim for the kilometres travelled that are related to providing ride-sourcing services and earning that income. This includes driving to pick up a customer and to fill up with fuel. The first method is “cents per kilometres travelled”. If you are claiming less than 5,000 kilometres for the year you can be reimbursed (the current rate is 0.68 cents per kilometre*) to cover expenses for general running costs including fuel and oil, insurance, servicing, maintenance and depreciation. To work out how much you can claim, multiply the total business kilometres you travelled by the current rate. The second method you can use to calculate car expenses is the “Log Book” method. If you are claiming for more than 5,000 kilometres each year you must keep a logbook for a 12-week period. This information will then be used to average your annual percentage of vehicle expenses. Pre-printed log books can be purchased from most newsagencies. To establish a log book for a three (3) month period simply enter your odometer reading at the beginning and end of each trip and mark “Personal” or “Business” as appropriate. If you run your business from home, you can generally claim the cost of trips you make between your home and other places, provided you made the trip for business purposes. The ATO has provided a calculator to assist sole traders with claiming car expenses, refer to the ATO website or contact a registered BAS agent or accountant for further details. As a sole trader, it’s very important to allow sufficient funds at the end of the financial year to pay your income tax so that you avoid a nasty bill at tax time, especially If Uber driving is a second income and you also have a primary job. Remember that income tax is separate from the GST you pay in your BAS. Some strategies to help you save for your income tax could include opening an online bank account and depositing a certain percentage each month or ask your employer at your primary workplace to deduct an additional amount of PAYG tax from your regular wage. This option is an amount calculated by using the income from your last income tax return. The benefit of this method is that you’ll know the amount of your instalment each quarter. This option allows you to calculate your PAYG instalment amount based on your actual income multiplied by a percentage. The benefit of this method is that the amount you pay reflects your present income. If you applied for an AUSkey as outlined earlier, you will see a new statement appear in your Business Portal each quarter (or monthly by arrangement) however you can also apply for paper BAS. On a BAS you report your total income and the associated GST as well as your total amount of expenses and associated GST. The difference between the two figures is either payable by you to the ATO or owed to you by the ATO (if you have spent more than you have earnt). If Uber driving is your second income and you have other primary employment, you don’t need to include earnings from your regular employer on your BAS, those earnings are declared at the end of the financial year. How can I make my tax obligations even easier? Consider steps to make tax reporting easier such as using QuickBooks Self Employed as well as a registered BAS agent or tax advisor. Registered BAS Agents or Tax Advisors can assess your business for deductions you may not know about and can review your expenses to ensure you are claiming the correct rate of GST credits on your expenses. Depreciation is a deduction that a bookkeeper or accountant can make which will further reduce your tax liability. Basically, depreciation is assigning a portion of your vehicles (or other assets) reduction in worth as an expense each year. As an example, let’s say you purchase a vehicle for $35,000. In five years’ time that same vehicle may only be worth $17,000 as it is a depreciating asset and will be subject to wear and tear. The difference between your vehicle’s expected value at the end of the five-year period and the price that you originally paid is $18,000. This money can be seen as an expense to your business even though you are not physically paying any money out. The $18,000 in this example will be divided by the 5 years and $3,600 per year can be claimed as a depreciation expense meaning a potential tax savings of around $1,080 (based on a 30% tax rate). For advice specific to your business, contact a registered BAS agent or accountant. Costs of software such as QuickBooks Self-Employed, and accountants and bookkeepers’ fees, are recorded as an expense and are deductible. Kick back and enjoy your Uber income knowing all your tax obligations are met.